Bill Clinton — America's 42nd president — grew up in an extended family of modest means, but one rich with storytellers. "All my life I've been interested in other people's stories," he wrote in his 2004 memoir, My Life. "I've wanted to know them, understand them, feel them. When I grew up and got into politics, I always felt the main point of my work was to give people a chance to have better stories." Clinton's uncanny ability to connect with people, coupled with an extraordinary grasp of complex issues, made him one of the most talented politicians and leaders of our time, but one compromised by a history of loss and recovery, of failure and redemption. 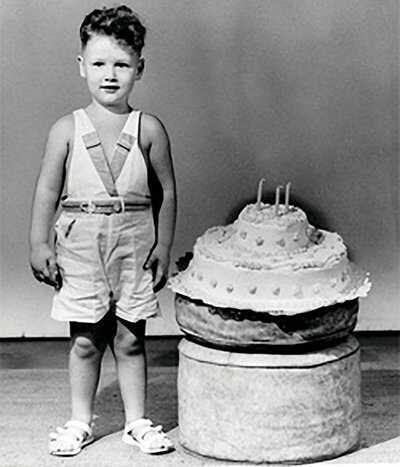 On August 19, 1946, his grandfather's birthday, William Jefferson Blythe III was born in Hope, Arkansas, three months after his father died in an automobile accident. When he was about a year old, his widowed mother, Virginia, a resilient and vivacious woman, went to New Orleans to train as a nurse-anesthetist, leaving Bill in the care of her parents, Edith and James Cassidy. Bill adored his grandfather, a grocer who set a rare example in the segregated South as an "uneducated rural southerner without a racist bone in his body," (Bill Clinton, My Life, Knopf Publishing Group, 2004, 11) as Bill would later remember it. When Bill was four, Virginia married car salesman Roger Clinton, whose last name Bill would legally adopt in his mid-teens. A few years later, the Clinton family moved to the resort town of Hot Springs. An outgoing and popular young man, Bill excelled in high school as a student and as a leader of school government, and he became a top saxophone player. On Sundays he would walk to the local Baptist church, usually by himself. But he was leading a dual life. At home, he was defending his mother and his much younger half-brother, Roger Jr., from his stepfather Roger Sr.'s drunken and abusive tirades. "Bill Clinton always found himself trying to redeem and rescue his family," historian William Chafe remarked in the film. "Part of doing that is to... put yourself in the position of rescuing not just your family, but everybody, including yourself, by doing good." As Bill himself later observed, however, "No one can live parallel lives with complete success" (My Life, 149). 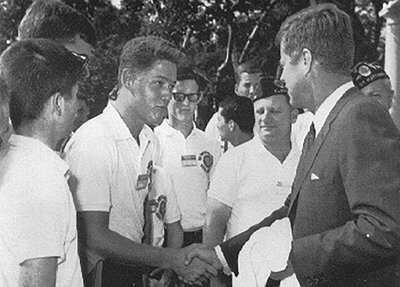 Clinton meets JFK in 1963. As a teenager, Bill considered careers in music and medicine. But in 1963 he took a trip to Washington, D.C. as a delegate to Boys Nation; in the White House Rose Garden, he scrambled to make sure he was at the front of the line to shake hands with John F. Kennedy, the president he had defended in a ninth-grade debate. That same year, alone in his den in Arkansas, Bill watched Martin Luther King Jr.'s I Have A Dream" speech on television. He was moved to tears by portrayal of a "beloved community," and he memorized the address. At age 16, he made the decision to forego music and medicine and go into public service. "That's what I wanted to do," he would tell O magazine in 2004, "to put things together, make it better for people." Bill returned to Washington to attend Georgetown University, graduating Phi Beta Kappa in 1968 with a degree in international relations, and he won a Rhodes Scholarship to Oxford University. Strongly opposed to the Vietnam War, he worked at the national headquarters of the Vietnam Moratorium and helped organize demonstrations at Oxford in the autumn of 1969. Although he morally opposed the draft, he felt he had to accept it because of his political ambitions. Opponents later criticized him for his antiwar efforts, and accused him of using his connection to Arkansas Senator William Fulbright, for whom he had interned during the summer of 1967, to avoid being inducted into the military. After two years at Oxford, Bill returned to the U.S. to attend Yale Law School, but his interests centered on politics rather than law. 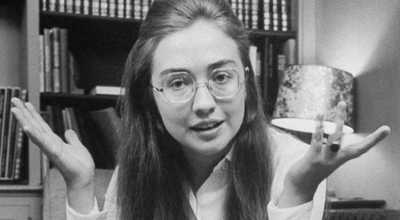 In 1971, he met fellow student Hillary Rodham, a "smart, resilient, and passionate" woman, he wrote, who "conveyed a sense of strength and self-possession I had rarely seen in anyone," and whose politics, like his, were "both idealistic and practical" (My Life, 183). That summer, he gave up a job coordinating Senator George McGovern's presidential campaign in the South to follow Hillary to California, where she had a summer internship. Returning to his home state after graduating from Yale Law School in 1973, Bill taught law at the University of Arkansas at Fayetteville, but his sights were still set on politics. He had deep connections there, including a large extended family spread across the state, and his political career took off rapidly. In his first bid for elected office, a run for Congress in 1974, he campaigned tirelessly and lost by just 5,000 votes against an entrenched Republican incumbent. Despite skepticism about his liberal background and the "outsiders" -- including Hillary -- who worked on his campaigns, he attracted public attention and showed himself to be a political natural. He also caught the attention of many women, a fact that did not go unnoticed in his circle and one that would haunt his political career. In 1975, Bill and Hillary married, and the following year Bill won the Democratic primary for Arkansas Attorney General. He and Hillary moved to Little Rock. In 1978, at the age of 32, Bill became the youngest governor of Arkansas and one of the youngest in U.S. history, defeating his opponent by a wide margin. With high ambitions, and, as he recalled, "an urgent sense to do everything" (David Maraniss, The Clinton Enigma, Simon & Schuster, 1999, 105) at once for his largely rural state, Bill went to work on education, healthcare, and infrastructure. His idealistic drive resulted in political mistakes during this first term, including funding roadway improvements through an extremely unpopular tax increase on car licenses. During the 1980 re-election campaign, the opposition portrayed Bill and Hillary as arrogant and inexperienced, and he suffered a landslide defeat. Despite the devastating election, Bill decided to run for governor again. He obsessively studied what had gone wrong, and in 1982 he was elected governor of Arkansas. He would remain governor for the next 10 years. Sharpening his focus the second time around, Bill adopted a more disciplined approach to governance and to politics. With education as the cornerstone of his agenda and Hillary as his point person, he pushed through sweeping reforms. Establishing himself as a moderate, Bill favored capital punishment and welfare reforms, while actively promoting affirmative action. His success in reforming education earned him the moniker "the education governor" and helped raise his national profile. Chairman of the National Governors Association in 1986 and 1987, he also chaired the Democratic Leadership Council in 1990-91. In this role, he helped craft a new national message for Democrats that coupled mainstream American values of opportunity and responsibility with a modern, progressive role for government -- a platform that could help win back the middle-class vote in an era dominated by the Reagan revolution. By 1987, Bill had become a leading voice among the New Democrats, and he planned to announce a run for the presidency. At the last moment, however, he backed out, citing concerns about the impact of the campaign on his family, including his seven-year-old daughter Chelsea. In reality, his political advisors were telling him the time was not right, and his extra-marital affairs had become a liability he could not ignore. Walking away from his long-time dream, not knowing whether he would get another chance, hurt Bill badly. In 1988, Bill suffered another public setback when his nomination speech for Michael Dukakis at the Democratic National Convention fell flat. Rebounding almost immediately, Bill appeared on Johnny Carson's Tonight Show where he poked fun at himself and famously played his saxophone with the band, regaining public approval. 1992 Presidential Campaign - "The Comeback Kid"
By the fall of 1991, Bill was again considering running for president. With the economy in recession and widespread public dissatisfaction on domestic issues, Bill sensed an opening. As he recalled in his book, President George H.W. Bush "seemed determined to coast to victory on the wings of the Gulf War," while Bill "had seen enough in Arkansas and in my travels around the country to know America couldn't coast through four more years" (My Life, 478-79). A sign at Clinton headquarters put it more succinctly: "It's the economy, stupid." Following a second-place finish in the New Hampshire primary, Bill earned a new nickname: "The Comeback Kid." He had recovered from two severe blows: reports of an affair with Gennifer Flowers -- which Bill endured with Hillary's public support -- and accusations of dodging the draft. A primary win in New York, along with victories in several southern states, proved Bill to be more than a regional candidate, and he went on to win the national Democratic nomination. With 44-year-old Tennessee Senator Al Gore Jr. as Bill's running mate, the ticket projected an image of a new generation. Relying on the country's desire for change and a new beginning, Clinton defeated Bush and independent candidate Ross Perot, and came into office with a landslide electoral vote -- 43 percent of the popular vote -- in a record turnout, and the support of "Reagan Democrats." At age 46, Bill Clinton became the youngest U.S. President since John F. Kennedy. And for the first time in 12 years, the same party held Congress and the White House. In his inaugural address, Bill promised change: "Not change for change's sake, but change to preserve America's ideals -- life, liberty, the pursuit of happiness. Bill passed landmark legislation in keeping with his campaign promises, including the Family and Medical Leave Act, the North American Free Trade Agreement, and the Brady Bill on handgun control. But there were echoes of his first gubernatorial term in Arkansas: public opinion about him personally was divided; he and Hillary were inexperienced in handling Washington politics; and the Clintons had powerful enemies. The failure of his healthcare reform effort, an enormous undertaking he had pegged as his signature initiative and tasked Hillary with leading, was a devastating setback that helped Republicans turn the midterm elections into a "referendum on Bill Clinton" (The Choice: How Bill Clinton Won, Bob Woodward, Simon & Schuster, 2005, 52) and sweep into power in Congress. In 1995, a budgetary standoff with Speaker of the House Newt Gingrich resulted in a lengthy government shutdown late in the year. The public eventually sympathized with Clinton, who refused to capitulate despite the possible political impact. "From that moment on," recalled Clinton's chief of staff Leon Panetta, "it became a renewal of Bill Clinton, in terms of who he was, both within himself and with the American people." Building on the momentum he gained after winning the battle over the government, Bill worked to pass a number of smaller initiatives in 1996 that appealed to the middle class, and he refined his message in response to public sentiment, declaring in his State of the Union address, "the era of big government is over." On August 22, Bill signed a welfare-reform bill introduced by Republicans, further cementing his popularity. In the November election, he won a landslide victory over Senator Robert Dole, becoming the first Democrat in 60 years to be elected to a second term. But his second term was rife with scandal. Investigations begun during his first term into the Clintons' investment in Arkansas' Whitewater land deal resulted in Bill appointing a special prosecutor in 1994, an action he would later refer to as the "worst mistake" of his presidency. The investigation, led by independent council Kenneth Starr, would dog the administration for the remainder of Clinton's presidency. In early 1998, just as the Whitewater investigations were stalling due to lack of evidence, news of Clinton's affair with White House intern Monica Lewinsky leaked, and suspicions of illegal conduct prompted a new round of investigations. Clinton refused to resign in the wake of the scandal, saying during a press conference on February 6, 1998, "I was elected to do a job. I think the American people know two or three things about me now.... And I think they know I've worked very, very hard for them." In December, Bill Clinton became the second president in U.S. history to be impeached by the House of Representatives. In 1999, the Senate acquitted the president, who then personally apologized to the American people. Despite the scandals and breach of public trust that marked his time in the White House, Bill Clinton is credited with significant achievements as president. Internationally, he helped end the Bosnian War and worked to promote peace settlements in the Middle East and Northern Ireland. At home, he eliminated the federal deficit, expanded international trade, and presided over the longest peacetime economic expansion in U.S. history. He left office with the highest approval ratings of any postwar president, and remains one of the most popular U.S. presidents in recent history. In 2001, Bill Clinton launched the William J. Clinton Foundation, based in New York City's Harlem neighborhood and dedicated to addressing poverty, global health, economic opportunity, and the environment. A key program of the Foundation, the Clinton Global Initiative, works to foster public-private partnerships to devise innovative solutions to these issues. He has served as United Nations Special Envoy to Haiti, and in 2005 he partnered with President George H.W. Bush to help with tsunami relief in the Indian Ocean. The William J. Clinton Presidential Center & Park in Little Rock, Arkansas, houses the presidential library and museum along with the University of Arkansas Clinton School of Public Service, the first graduate school in the U.S. to offer the Master of Public Service degree. Press Scretary Dee Dee Myers discusses her first impression of Clinton, his tireless campaigning, and how they irritated H.W. Bush on the campaign trail.